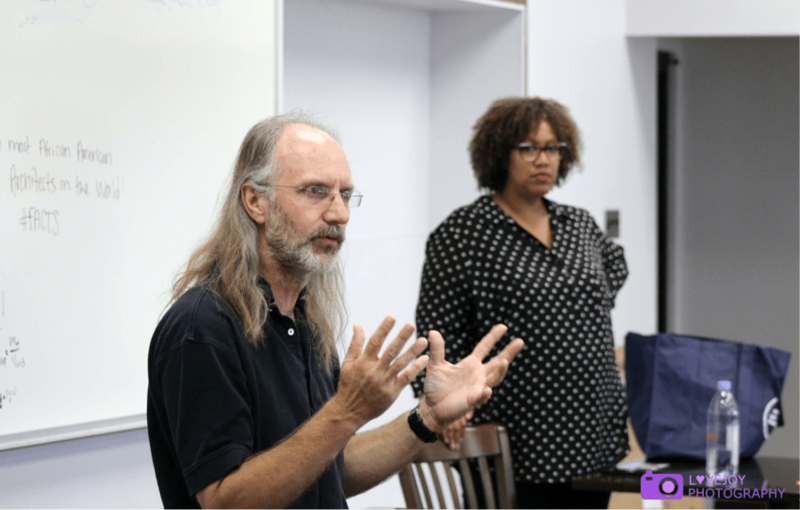 Richard HIlleman, vice president and chief creative officer at EA Games, visits Howard University with Mari Roberts, EA’s university relations manager. Eager students stand around the man behind Madden football and countless other games, reaching to shake his hand and introduce themselves. The man, Richard Hilleman, smiles from his chair as he shares small talk and anecdotes with them. Engineering students and gaming enthusiasts quickly fill the small room to hear Hilleman, the chief creative officer at EA Games, impart his insight on a number of game concepts created by their peers at Howard University. The event begins with a video titled “Fail Faster.” Created by the YouTube channel Extra Credits, the video discusses the process of game creation and innovation as a labor of testing and exposing ideas. The main message of the video is that “failing is how we get it right,” showing students that their dream games could come to life and prosper if they accept hard truths about their work and take the initiative to improve. Shortly after the video, Hilleman sits at a table in front of the audience while a student, Victor Foreman, takes the podium to pitch his game idea. Eight students, primarily engineering students, present ideas ranging from single-player puzzles to multi-player mobile games. What kind of team would they need to complete this project? What other resources would they require at this stage? How would the game make profit and be commercialized? Hilleman rates the pitches based on their answers, game ideas and overall presentations. Then, students in the audience vote to decide which of the pitches they would want to work on for a group project. So why did an influential EA representative decide to visit the HBCU for this event? “I have spent a lot of time at a lot of colleges,” Hilleman says, “and what I have found matters more than any other characteristic is the enthusiasm of the professors and the enthusiasm of the students to be a part of the project. So what kind of generational change did Hilleman find in Howard University based on the pitches? Although the room was filled with engineers, people of all backgrounds and skills can be successful in the gaming industry and help to fill the void for producers, designers and, to a lesser extent, game engineers. Amylia Johnson writes about gaming, the Internet, social media and books for 101Magazine.net.